Harmony Books, New York, 2015. 192 pages. 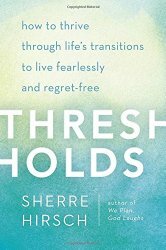 Here’s a book written by a rabbi with advice, tips, and encouragement about getting through life’s transitions. When I talk about the thresholds of our lives, I am referring to those moments when we are in transition, those moments when we are standing between the way we were accustomed to living and a new way of thinking, feeling, and being. I’m talking about those moments when we are preparing to enter a new “room,” to take the next step on the journey of our lives. Maybe we are in the hallway because our circumstances have changed: we became engaged or our parents got divorced. Other times it may be that something has changed within us: our job is fine but we have outgrown the work, or after five years we have become bored as a stay-at-home mother. These moments can be disorienting and scary, sometimes painful or even heartbreaking. Other times they can be exciting, hopeful, filled with possibility. For years anthropologists have studied these hallways, these “liminal moments,” a tern derived from the Latin word limen, meaning “threshold.” They have examined why we respond to them so differently when these moments are woven into the fabric of our lives. Why do some of us struggle to cross while others don’t? Why do some feel paralyzing fear at any sign of change while others feel intense excitement and others immense faith? Why do some of us refuse to move forward – or worse, move backward – while others lunge ahead with gusto? Why do some burst into tears, burst into joy, or not burst at all? Why is it that we may respond one way to one transition and completely differently to another? As I read this, I thought I wasn’t really in a transitional phase right now, and was appreciating her words from a distance. But the truth is, the fact that my son is in his last semester of college has been giving me bouts with the Empty Nest Blues – and that would certainly qualify in Sherre Hirsch’s definition of a Threshold. And I’ve certainly been through plenty of such phases, and am, in fact, in a place right now where I never expected to be when I was younger. My journey has not gone as planned, and her words are helpful for my situation, too. This book doesn’t necessarily present striking new ideas, but it does give encouraging reminders. It will help you face your next phase in life – and the transition to it – with less fear and more joy. Several quotes from this book made their way to Sonderquotes. Read them for an idea of the wisdom and encouragement found here. This entry was posted on Saturday, December 5th, 2015 at 11:15 pm and is filed under Nonfiction Review, Personal Growth. You can follow any responses to this entry through the RSS 2.0 feed. You can leave a response, or trackback from your own site.